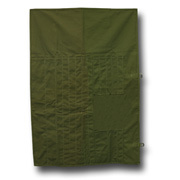 Tool Roll Features 16 Pockets for securing auger bits. Two flaps keep bits from sliding out plus two web straps and buckles. Made of #10 OD cotton duck.